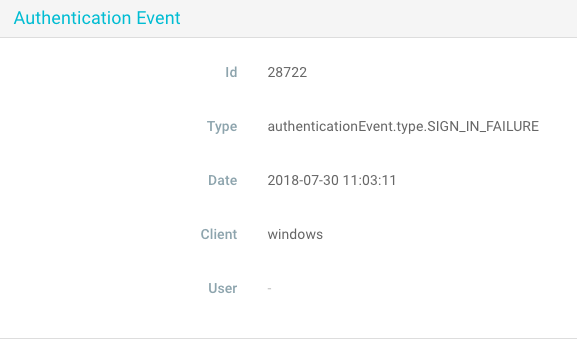 The Authentication Events tab is used to view application log-ins associated with account. Please note that you must have ADMIN or SUPERUSER privileges in order to access this feature. ID The unique ID of the log-in event. This ID is generated automatically by the application. Type The type of log-in event. Options include: SIGN_IN, SIGN_OUT, SIGN_IN_SAML, SIGN_IN_FAILURE, etc. Date The date and time at which the log-in event occurred. User The account user associated with the log-in event.